Refurbished or returned units – Post Carry Co. Transfer Case makes travel with your full-sized bike as protective yet nimble as possible, so you can get to what’s most important: riding. Expand it, fold it, roll it, wear it - Transfer Case is fully mobile, whether you take it on plane, train or bus. Transfer Case will ship from our warehouse partners in the U.S. and Asia (wherever is closest to you). If you do not see your country listed at the Checkout, please send us an email at info@postcarry.co and we would be happy to provide a shipping quote. Duties and taxes (if applicable) vary by location and order amount. Returns and Exchanges are permitted within 30 days from the date of delivery. Buyer is responsible for return postage. In order to be eligible for exchange or refund, items must be unused and in their original packaging. Please contact us at returns@postcarry.co with your order information beforehand to arrange a return. Post Carry Co. inspects each and every product that gets shipped, but in case we missed something, a replacement for a faulty item will be provided to you at no cost. If an exact replacement is not available, we can arrange to provide you with a similar item, a merchandise credit for the value of the original item, or a full refund. FOLD IT. CARRY IT. BRING IT. Rigid polycarbonate side panels and thick foam padding protects your bike from the harshness that checked-in luggages face. At under 6kg for the case alone, Transfer Case is the best way of saving money by reducing your weight charge with airlines that charge fees by weight. Transfer Case fits nicely into a small car’s trunk. No more negotiating with taxi drivers unwilling to deal with a bigger case. Its nimble size and shoulder straps make getting around by train, scooter, or even bicycle, a no-brainer. Rolling Transfer Case through narrow streets is a breeze with its external wheels. Once you’re at your hotel or place of stay, Transfer Case is easy to carry upstairs using its rugged handles or even its integrated shoulder straps if you want to carry it on your back. Folded Size 76 x 36 x 36cm / 30 x 14 x 14" 76 x 43 x 36cm / 30 x 17 x 14"
3 Use the chart below to determine size. 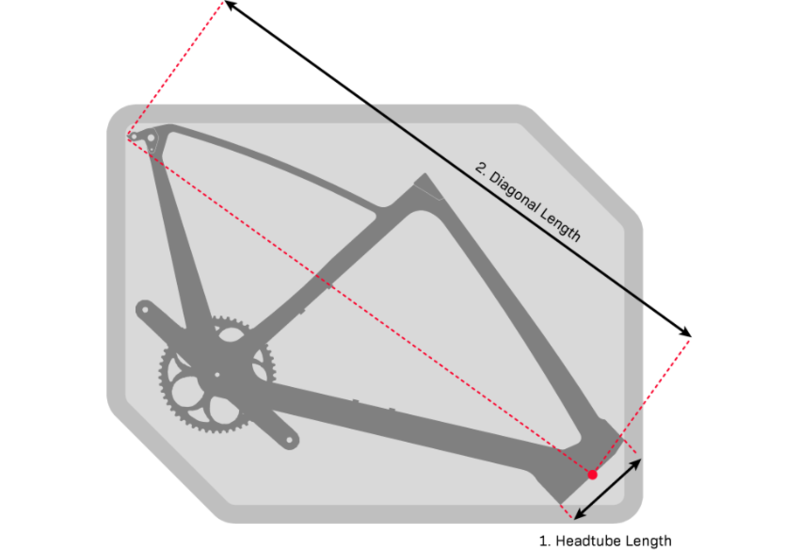 135L Transfer Case: A frame with a 18cm headtube and diagonal length measured 98.3cm or less. 150L Transfer Case: A Specialized Roubaix size 61, by our measurements, has a headtube length of 20.5cm and a diagonal length of 100.2cm. In general, most travelers will prefer the smaller Transfer Case (135L) if their frame size allows for it. If your frame's diagonal dimension exceeds the limit of fitting the 135L Transfer Case by only a few millimeters, keep in mind that the Case’s side panels have thick foam padding that will take up a bit of extra material on any side. Write to us at info@postcarry.co if you have any questions on Case fitting. Follow us on Instagram @postcarryco! Copyright © 2019 Post Carry Co.